Heat oven to 180 degrees and line an oven tray with baking paper. In a large pot, boil the potatoes for 15 minutes or until soft. Drain water and place potatoes onto the baking tray. Using a fork, carefully flatten each potato but keep in one piece. Drizzle potatoes with olive oil and sprinkle with garlic and salt and pepper. Place into the oven and bake for 15 minutes or until golden and crispy. Remove potatoes from oven and top with a dollop of pesto and a sprinkling of chives and parsley. For many families, potatoes are a staple vegetable and are enjoyed in so many different ways - mashed, steamed, baked, roasted, boiled, made into soup, fried or cooked on the BBQ. 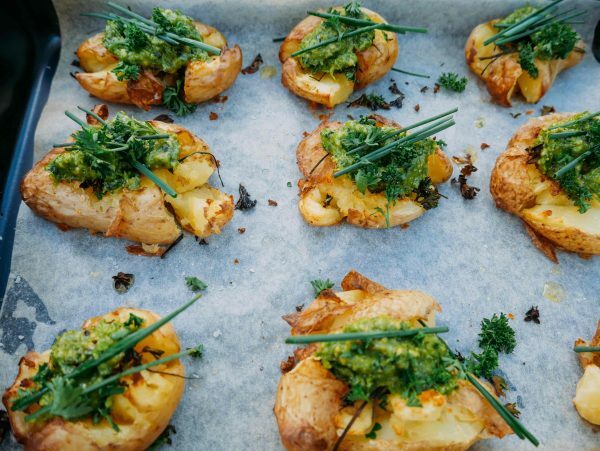 I am always looking for new ways to cook potatoes and recently, I have been enjoying them baked and topped with garlic, olive oil, pesto, chives and parsley. This is the perfect side dish and can be served alongside a green salad. The potatoes are fluffy on the inside and crispy on the outside. Nutritionally, potatoes are fantastic for usl! They contain Dietary Fibre, Niacin, Potassium, Vitamin C and Pantothenic Acid which helps us unlock energy from food, great for growth and development in children.